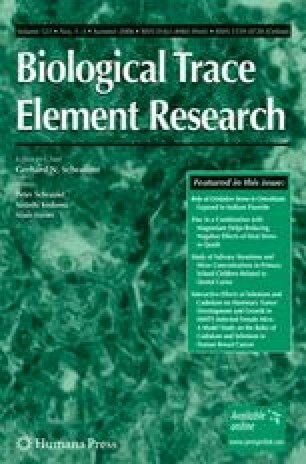 Previous studies demonstrated that the age-corrected breast cancer mortalities in different countries are inversely correlated with the per-capita dietary intakes of selenium and directly with the estimated intakes of cadmium, zinc, and chromium, suggesting that the anticarcinogenic properties of selenium are counteracted by these elements. The tumor-preventative effects of selenium and the converse effects zinc and chromium have already been confirmed experimentally in studies with female inbred C3H mice carrying murine mammary tumor virus (MMTV). Using the same model of human breast cancer, it is now demonstrated that cadmium abolishes the cancer-protecting effects of selenium. In addition, cadmium was also found to interact with zinc, copper, and chromium. At 1.4 ppm in the drinking water, cadmium caused a significant depletion of zinc in vital organs such as the liver, which is held responsible for a delay of the appearance of the mammary tumors by 4 months and their slower growth rates relative to the Cd-unexposed controls. The results of the present study are relevant to human breast cancer prevention as selenium counteracts the effects of cadmium. This paper is dedicated to the memory of Dr. Leonell C. Strong (1894–1982), the originator of the inbred C3H mouse strain used in the present study. This work was supported, in part, by funds from the US Department of Agriculture; the US National Science Foundation; and the University of California, San Diego. The experimental assistance of D. Hamm, L. Bell, R. Pelton, J. Palmer, and T. Molenaar is gratefully acknowledged.